It’s hard to count the number of crowdfunding platforms now operating on the internet. It’s likely to run into the 1000s, though, and that includes charity sites, peer-to-peer lending, benefits and equity crowdfunding. They are very different but all have one thing in common – they connect the fundraiser with the investor or donor. I have recently become interested in crowdfunding because I think it’s the Next Big Thing. Also, there’s a lot of noise on social networks about it. Trouble was, I didn’t know much. Unlike many of my blog posts, this one is about a subject I know little about. Even now I only know the minimum required to write something meaningful on the subject. But here’s my hunch. Bear with me. In the 1990s we saw the internet moving from a largely unknown environment to one which penetrated many people’s lives in some way. After the fanciful “.com” bubble burst in 2000, attention turned from technology companies to companies that could exploit the internet. So as the 2000s progressed we saw the rise first of Google then the various social network and sharing sites like Facebook, Youtube, Flickr, Twitter, Tripadvisor and MySpace, the last of these reassuring us that success wasn’t a foregone conclusion. Internet retail took off too, mostly in the form of Amazon and Ebay. Then we get to the 2010s, and we start to see the rise of companies using social network technology in their business model, the usual examples being Uber and AirBnB. And it is here where crowdfunding steps in too. Just as Uber ans AirBnB “disrupted” the markets in taxis and holiday accommodation, so crowdfunding sites have crept in to disrupt a space that financial companies had previously dominated. I think the historical perspective is important. It shows that internet technology has enfranchised people in so many ways, and will continue to do so. Where intermediaries charging high fees and operating opaque practices once dominated, sites linking buyers to sellers have effectively democratised the market place. In our case, brokers operating through stock exchanges are now replaced with sites where businesses can raise funds directly from speculators, longer term investors and consumers. Although crowdfunded projects and businesses tend to be small, mostly below $100,000, $1m-plus funds are not unheard of. The market is only going one way – upwards. How long before businesses requiring $10m start using crowdfunding as their preferred way of raising capital? I suspect not long. Without realising it, I had already taken part in a crowdfunding project. In fact it was based on the original crowdfunding concept by the progressive band Marillion. The band, short of cash, needed to finance its new album, and to cut a long story short, its fans offered to advance the money in return for the CD when it was eventually released. The band’s Mark Kelly explains all at this TED talk. As time went on, more and more bands and performers, usually performers with a large fan base but little or no growth prospects, and hence of no interest to record companies, used this model. For my part, I pre-ordered an album by another progressive band from the 1970s, Caravan as it seemed a fun thing to do. In fact Pledge Music has been the conduit for many an album over the past few years. I had heard so much about crowdfunding that it was time to explore further. I first looked at Indiegogo, a site claiming to have raised $800m for projects and campaigns. My visit to turned out to be much longer than anticipated. The lead offer was to fund a movie about the Birmingham reggae band Steel Pulse, my favourite reggae band when I was a student. I ended up buying an advance copy of the DVD, signed by the band, for $45. At this rate my interest in the dynamics of crowdfunding was turning into an exercise in retail addiction. I resisted buying into various offerings of quadcopters, fashion accessories and fitness technology and moved on. Crowdfunding looked fun, but expensive. Next stop Kickstarter. Probably the best known platform that concentrates purely on projects, and doesn’t entertain awareness campaigns or charity. Based in New York, it is an all-or-nothing funding site, so each project is either a complete success, funding-wise, or it gets nothing, with the investors getting their money back. Kickstarter has raised over $2 billion of funds for projects listed on its site to date. Third stop on the crowdfunding line was a UK-based site, Crowdcube. Emerging from the University of Exeter, Crowdcube has raised £132m so far. Projects are mostly looking for equity buyers and projects where funding is actively ongoing as I write range from eco-car rentals to drinks to real estate. This last project was seeking funding in the form of a business loan, paying back 7.5% interest. Having looked these three large crowdfunders, the rest of my research was largely browsing. I came across a sites I never realised were crowdfunding sites, because their purpose was to facilitate charity donations like GoFundMe. And I took a look at another site I knew about, Funding Circle, which facilitates business loans. But the type is corwdfunding that really took my interest was equity crowdfunding. Having worked for a stockbroker which became part of an investment bank, then an integrated bank, I reckon I know a thing or two about equity markets. Companies raise money through share issues, where the broker contacts its list of investors and attempts to place the required number of shares in return for a fee. Usually quite a large fee. The issue might be underwritten, which means that if the broker can’t place all the shares, it buys them instead. This commands an even bigger fee. Some share issues, usually large ones, are offered to the public, although even then, the majority of shares still tend to get bought by institutions. The equity crowdfunding process works in a very similar way. But the main difference is that the fundraising is done without the need for a broker. It’s completely peer-to-peer, with the funding website performing many of the tasks the broker would have performed. It might be easy to critique equity crowdfunding as being riskier than traditional share offerings, and perhaps it is, or perhaps it isn’t. I recall one equity placing led by my previous employer that resulted in the MD running off with the money. So fraud certainly happens at all levels of the financial hierarchy. 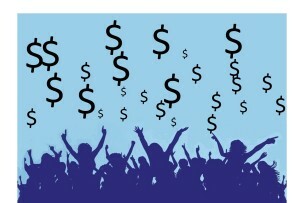 Equity crowdfunding might appear to be free, but it’s not. Fees vary from platform to platform and from task to task. Typically, someone raising money will pay between 3.5% and 7.5% of the money raised to the site. But additional administration tasks, not always optional, incur a fixed price typically around £1000 or $1000. Further, investments which are paid using a credit card incur handling fees. These might be low, 0.5% for a UK investor into a Crowdcube project, or much higher. Kickstarter charges 5% of the amount raised plus 3% to cover card handling. Angels Den, like Crowdcube, charges 0.5% card fees but it charges 6.5% of the amount raised, with 20% of that amount being invested into the issue. Consequently, Angels Den becomes a shareholder in each project launched using its services. Thus far I have painted a rosy picture of crowdfunding. But not everyione agrees. Daniel Isenberg lists four problems with equity crowdfunding. They can all be critiqued, especially as #4 in the list tells us we are stupid. Presumably that applies to share issues from national governments or large corporations (like Facebook) too! Mr Isenberg highlights the risks, which is fair enough, without considering the opportunities. In our free market, crowdfunding is a far better expression of capitalism than the corporate capitalism espoused by many governments in developed nations, who frequently have financial links to governments anyway. I will concede that Mr Isenberg is right about due diligence, though. It’s risky enough investing into new ventures, but a bit of extra due diligence will help us avoid some obvious mistakes. Another critique comes from Mark Kelly in the video at the start of this article. He points out that when crowdfunding becomes a business in itself, the “house wins”. He means that his venture connected his band directly with fans, and there was an existing degree of trust and enthusiasm. Next to any successful marketplace, you will find people offering related services. Monsterfunder.com will run a Twitter campaign for you and Fundraiserhero.com goes one stage further, and engages Monsterfunder.com and other Twitter campaigners with a one-stop shop. Based in Bulgaria, Cadia SE offers a secondary marketplace for its funded projects, so you can invest and then sell your shares later. Josef Holm at Crowdfunding.biz offers a community approach to help crowdfunders and business owners connect. These are just a few of the many people who have contacted me in the last few days, and I suspect just the tip of a very big iceberg. In the 1990s there were thousands of internet providers. Today many people will connect to one of a handful of networks in their home country, likely to be operated by a telecom company. We can trace the same story with search engines and social networks. So can we expect the many crowdfunding sites to be reduced to a small number of key players? I think so. Either through acquisitions and mergers, or by a major new entrant, perhaps Google or Ebay, the role for smaller sites will diminish as economies of scale start to become meaningful and larger sites will offer lower fees. The open question will be: How will regulators react? Currently crowdfunding is either unregulated or just partly regulated. But as we have seen with high interest loans, regulators will step in if it looks like the public need to be protected. And also because financial companies will demand a level playing field. Whether regulation changes the crowdfunding marketplace or not remains to be seen, but I suspect they will co-exist and neither will go away. The original crowdfunders, Marillion, are actually crowdfunding their latest album on Pledgemusic right now. Great music that is worth exploring. Thanks Geoff. Great to know that Marillion found the winning formula so early. An innovative fan base too!